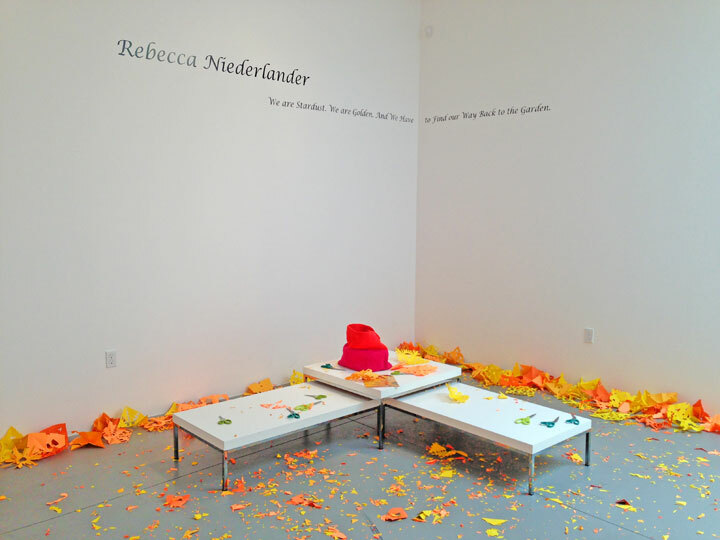 Los Angeles-based artist Rebecca Niederlander has provided the public with a space for engaging in her art. As a community engagement artist, Niederlander believes that people attain a deeper, more cell-level, experience when art is interactive. 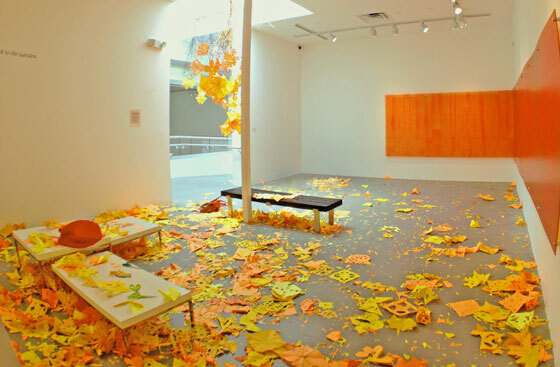 Well, then, can I Walk beside You provides the visitor with a place to make paper flowers to take away. 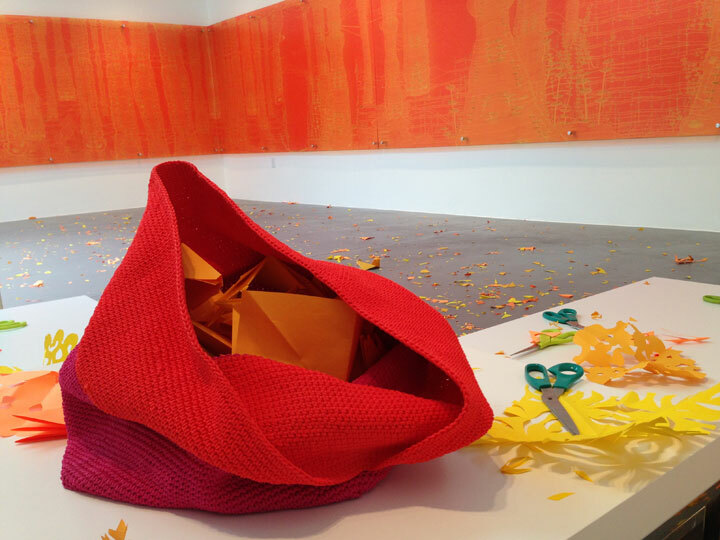 To make the paper flower, simply cut shapes out of the folded sheets of paper, but leave the cuttings on the floor. The cuttings become part of the larger installation, adding a wild field of color, much like the iconic California poppy does when the climate is just right. The desert had very little rain and the poppies have been difficult to find, when usually they blanket the hillsides at this time of year. Well, then, can I Walk beside You honors our beautiful state flower while offering a place for visitors to engage with each other, with the installation, and with their own memories of poppies past. Hanging above you, in the gallery atrium, is The Circle Game, a site-specific installation utilizing the skylight a locus for ascension. 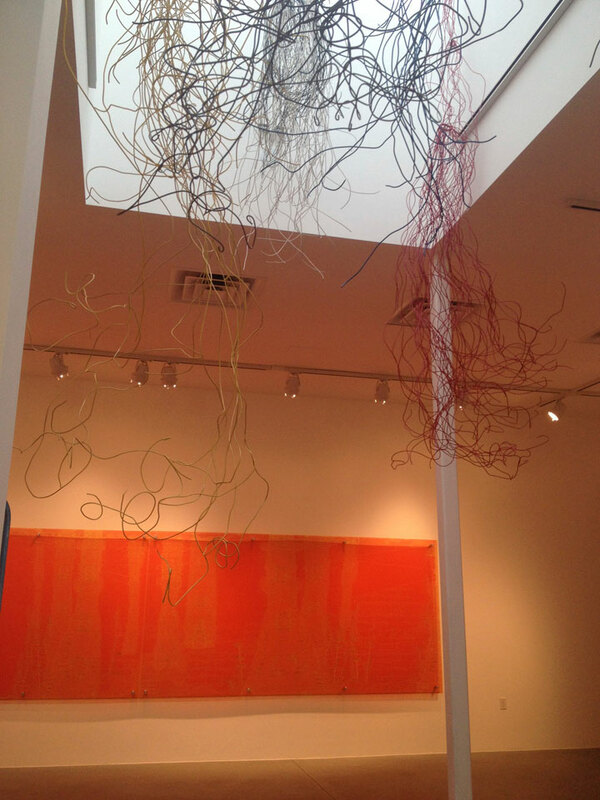 Each wire element in the work exists as a place-holder, metaphorically carrying a lifetime of experience and information. As the elements ascend, they appear to shed. The plastic coated copper conduit itself is both historic and contemporary, some of it having been discovered in the back of an old dusty hardware store and some having been whisked from a daily shipment at Home Depot. Each wire, though, has a kind of “muscle memory” remembering the kinks from the spool it was wound on and from the bends and manipulations it has endured over multiple uses. Some of the kinks can be straightened and thus concealed and forgotten, while other kinks alter the wire permanently. We Are Stardust. We Are Golden. 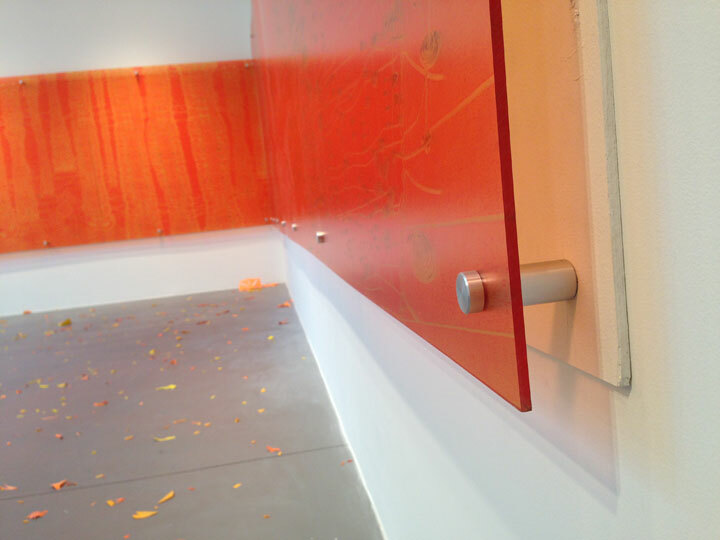 And We Have to Find Our Way Back to the Garden is a triptych of digitally printed acrylic panels hanging at the northeast corner of the gallery. The patterning is reminiscent of a forest, inviting the visitor to visually walk through it into a glowing field. 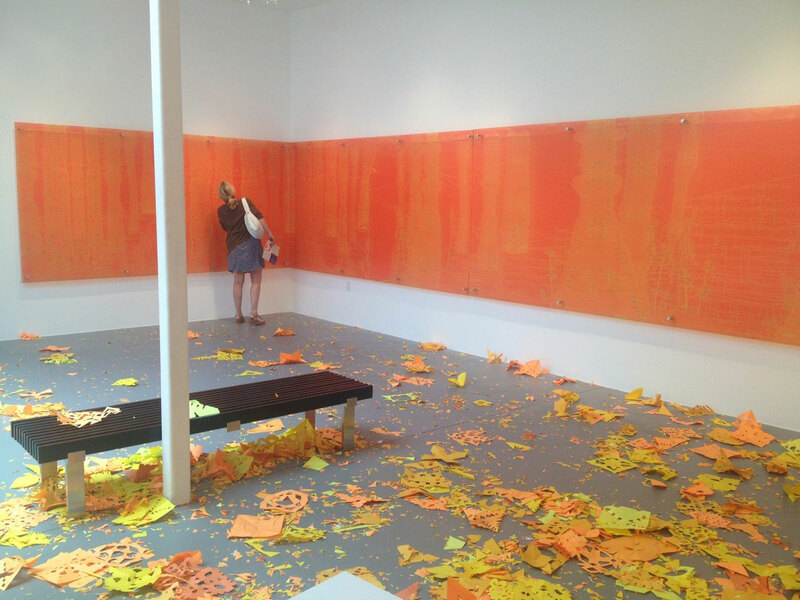 Oranges and yellows appear here as well, unifying the installation in the colors of the California desert. Additionally, Niederlander’s forest pattern adorns the museum’s exterior BLOOM banners. The titles Well, then, can I Walk beside You, The Circle Game and We Are Stardust. We Are Golden. And We Have to Find Our Way Back to the Garden are from songs written by Joni Mitchell. 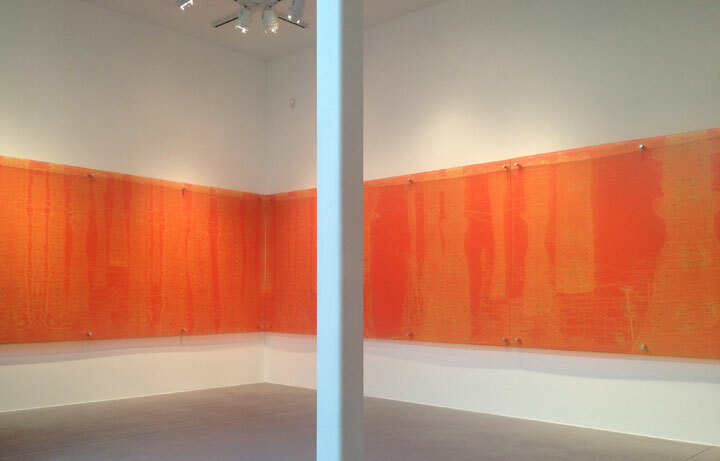 Niederlander has long used songs in titling in her work, often referencing a particular moment in history through the shared experiences in narrative music. Opening reception after visitor participation with Well, then, Can I walk beside You?